Wisconsin is Open for Business Wisconsin Workforce Strategy: Advancing Synergies with the Wisconsin Society for Human Resource Management Manny Perez Secretary. 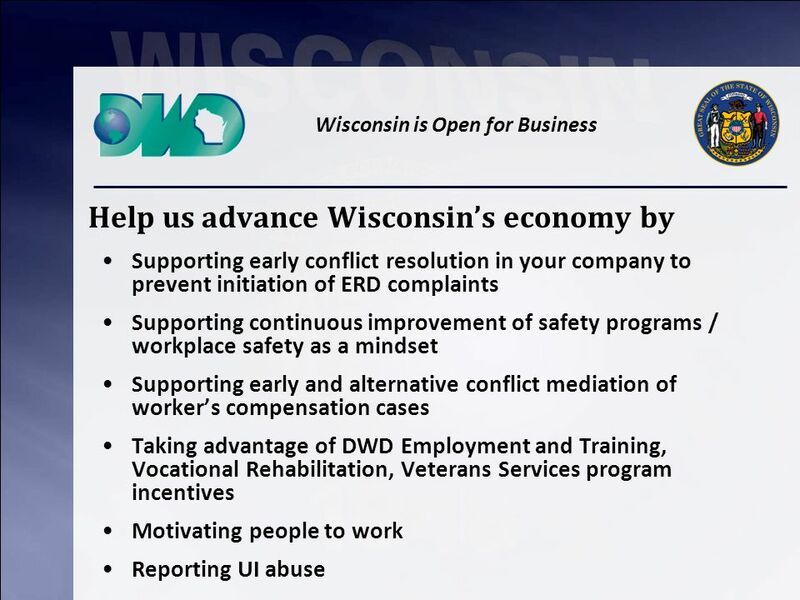 2 Wisconsin is Open for Business DWD Mission Advancing Wisconsins economy through a leading workforce development system that attracts, creates, and retains jobs, and empowers individuals to become self- sufficient. 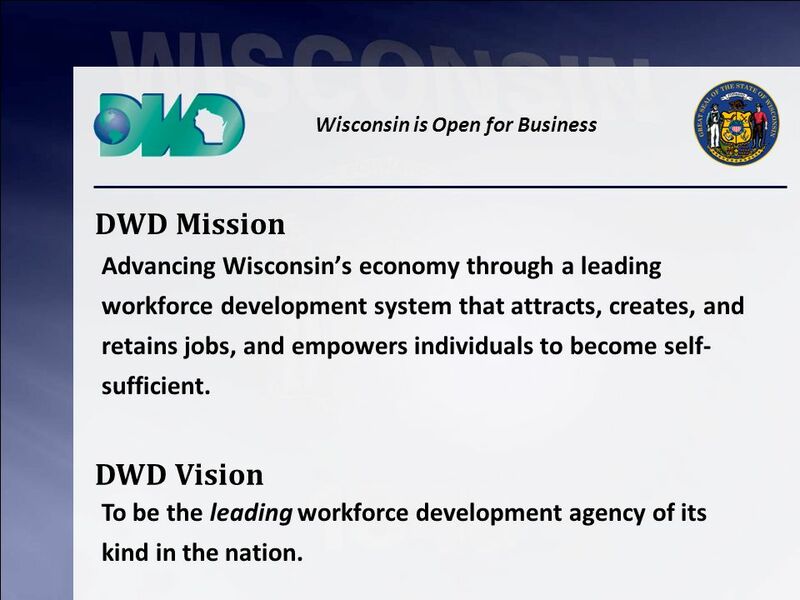 DWD Vision To be the leading workforce development agency of its kind in the nation. 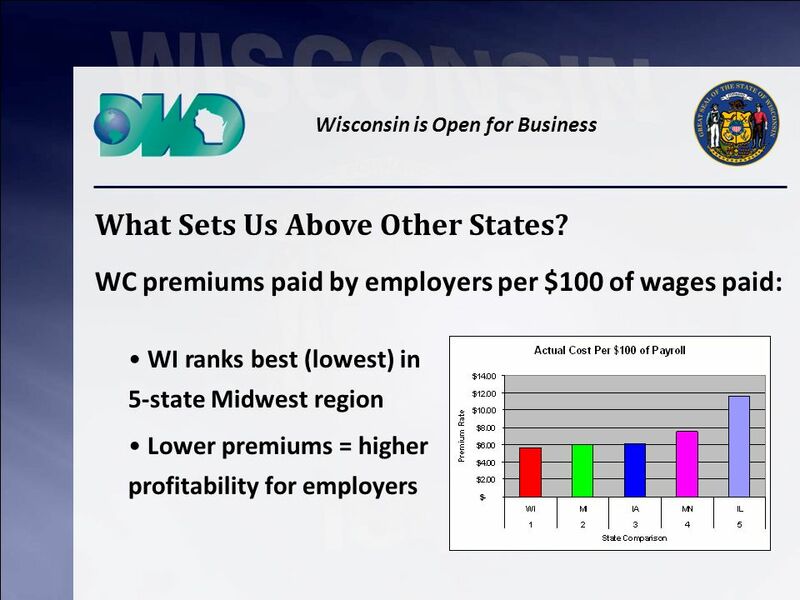 4 Wisconsin is Open for Business What Sets Us Above Other States? 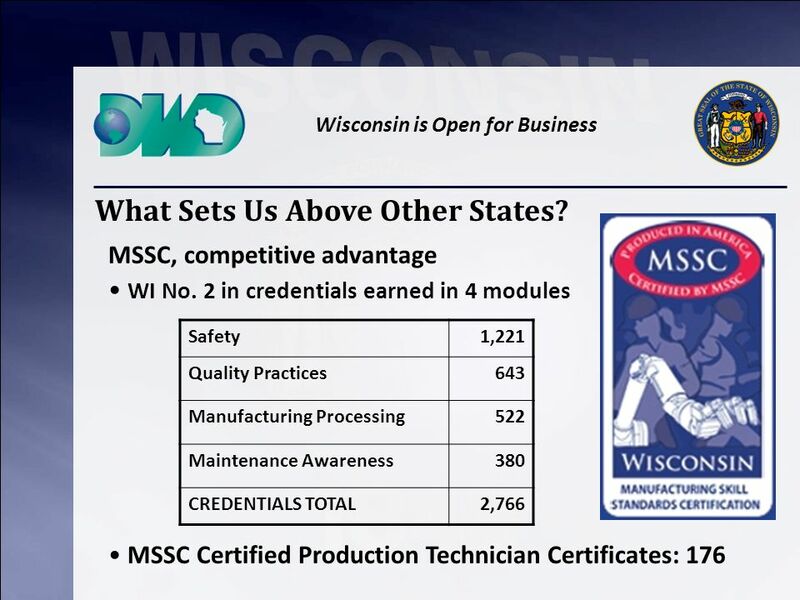 Wisconsins work ethic outpaces U.S.
12 Wisconsin is Open for Business Questions & Answers How can we work better with you to meet workforce needs? 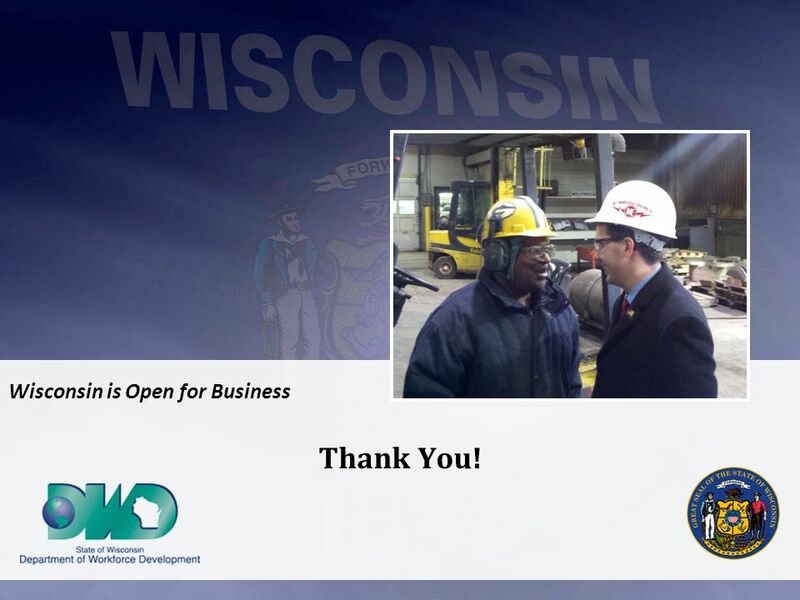 13 Wisconsin is Open for Business Thank You! 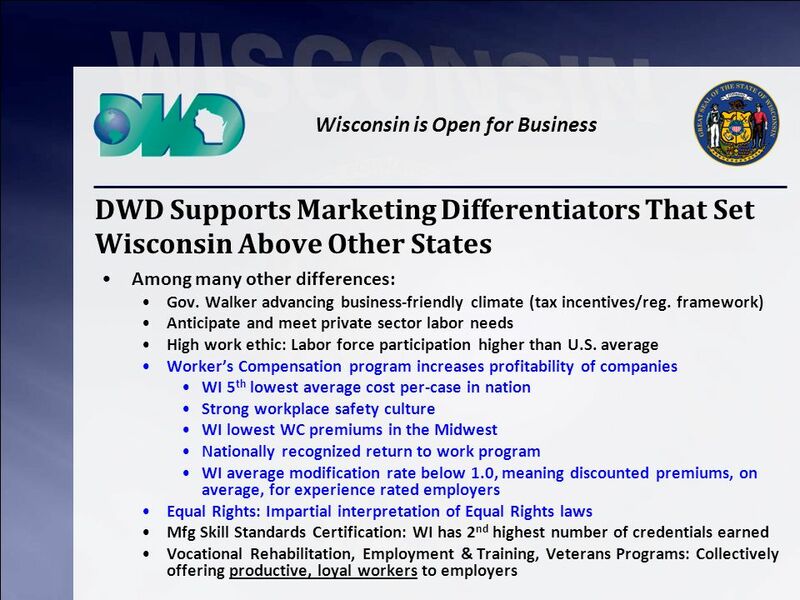 Download ppt "Wisconsin is Open for Business Wisconsin Workforce Strategy: Advancing Synergies with the Wisconsin Society for Human Resource Management Manny Perez Secretary." Office of Purchasing and Contracts Procurement Outreach Training Level II - Module D State Finance Law; Ethics; OMB Guidelines. House Transportation & Economic Development Appropriations Subcommittee Presented by: Lois Scott, Workforce Program Support Manager, Department of Economic. 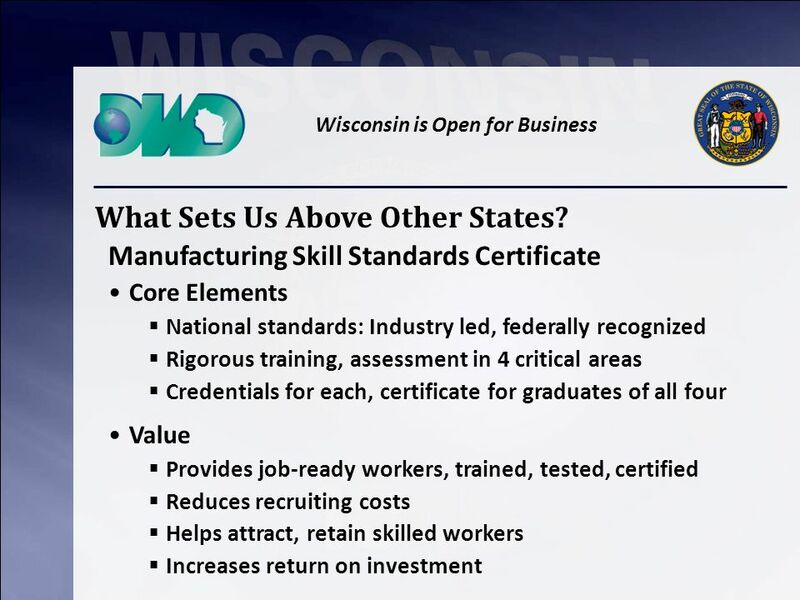 Advanced Manufacturing Partnership: AMP 2.0 November 18, 2014 Minding the Gap Investing in a Skilled Manufacturing Workforce. U.S. Department of Labor Assistant Secretary William E. Spriggs Office of Policy July 25, NAACP Convention: Labor Workshop Labor Market Outlook. Associated Industries of Massachusetts How Much Social Insurance Should the Government Provide? 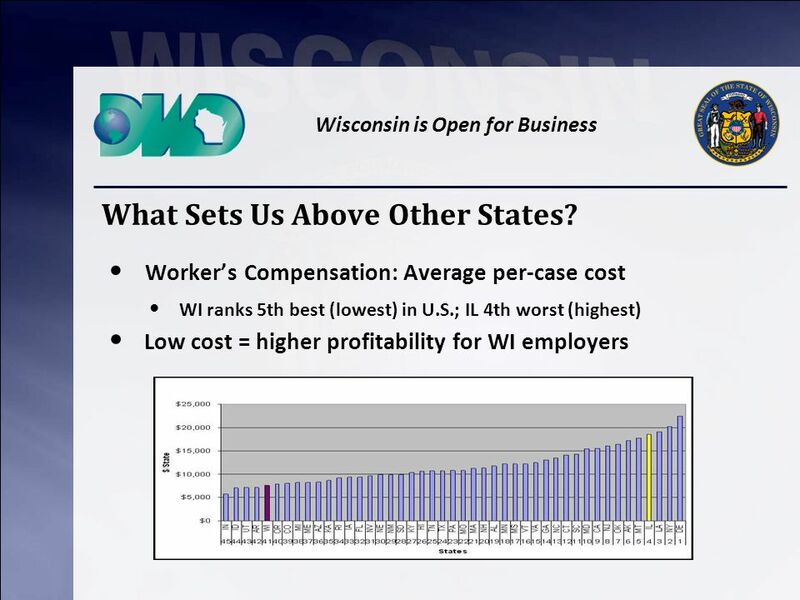 Workers Compensation and Unemployment Insurance Richard. 1 w w w. c a p l a b. o r g. p e Rio de Janeiro, May 20 – 21, 2008 Panel 3: Developing and encouraging comprehensive policies, strategies, and services. Workforce Indicators & Skills2Compete Maryland Baltimore Washington Corridor Chamber Regional Workforce Summit June 9, 2010. 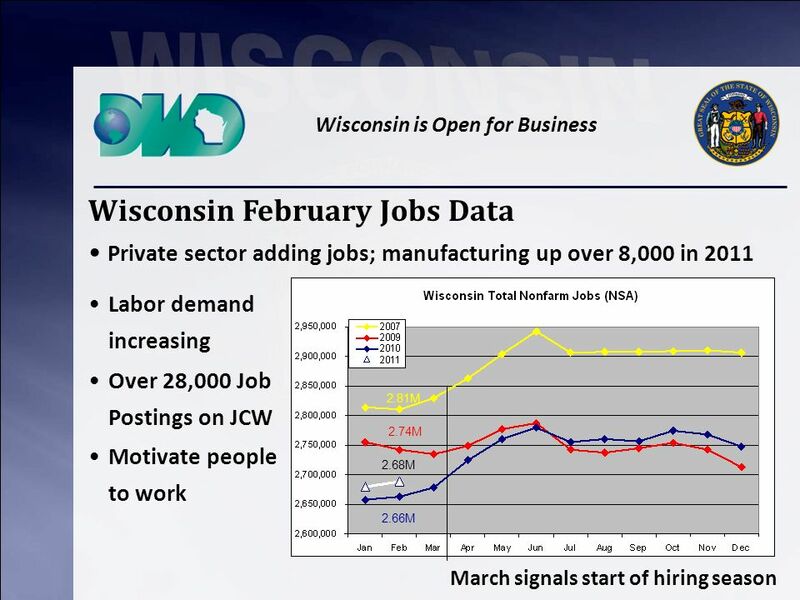 Job Listings Recruiting, Screening and Hiring Services Labor Market Information Access to Employee Training and Retraining. 2015 Labor Day Report: Annual Report on the State of Montana’s Economy Barbara Wagner Chief Economist State Workforce Investment Board Meeting September.